The works in question appear to have been placed in the most inconspicuous spots possible. In this way they emphasise the sheer contingency of the encounter. As you walk along the corridors and rooms of the Palace you find each work by chance, or wheresoever, or simply because of its proximity. This sense of contingency is emphasised in So Far Flung, a work whose title is stencilled on a gilded mirror. The reflective surface introduces the slightest gap between the letters and their reflection, and it was not until my second round of the exhibition that I noticed the work. For something to be ‘so far flung’ is for it to be both distant and beyond belief – and the work seems to betray Weiner’s own incredulity at working within a space that is as opulent as it is historically conflicted. The artist’s works are often socially engaged, albeit in a subtle and elliptical way. That he should now be exhibiting at Blenheim Palace, a private house whose history is inextricably tied to the aristocracy and to the military (the Palace was built in the early 18th century to celebrate victory over the French in the War of the Spanish Succession), raises a difficult set of questions that the works seem reflexively aware of. Elsewhere in the Palace are larger works that have a comparably ambiguous relation to their surroundings. In one room hangs a large plastic tapestry covered in vinyl lettering: Far Enough Away As To Come Readily at Hand, a statement which to my mind reads as an elegant, elaborate way of saying ‘just right’. And indeed the work feels this way, four curved lines evocative of the English Baroque architecture of Blenheim Palace, while at the same time offering a stark contrast to the sumptuousness associated with this architectural style. But again what is difficult to ascertain is the effect the work has in such a space, the extent to which it works against it or is subsumed by it. The idea of ‘simultaneity’ is here only precariously maintained. Perhaps the most explicitly critical works are three ceiling pieces that occupy one of the large state rooms. 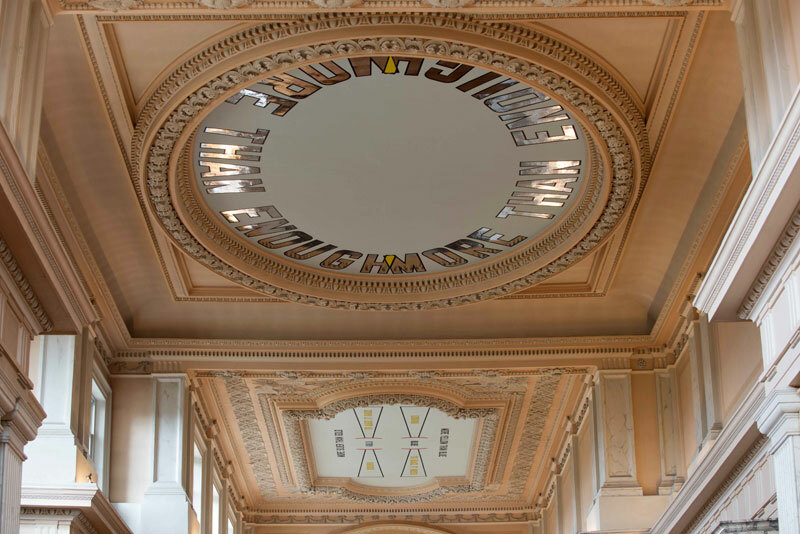 In the first, for example, the words ‘MORE THAN ENOUGH’ are written in an oval shape that matches this part of the ceiling. The positioning of the work forces the viewer to look up and to turn his or her body, making for a dizzying experience. As is often the case with conceptual art, the work seems to do what it says: the ‘M’ at the beginning of the expression overlaps with the ‘H’ at its end, such that it comes to resemble a snake of letters swallowing its own tail. In this way a sense of excess is produced with otherwise restricted means, bearing witness to the excesses that underlie the Palace’s existence. The other two works on this ceiling comprise formulae that refer to such substances as gunpowder, silver and gold, invoking its military history. The works installed in ‘Within A Realm of Distance’ are as tightly conceived as anything Weiner has produced. But to my mind what makes the exhibition different to much of his previous work is that it betrays a degree of anxiety about the status of art and its ability to operate critically within such surroundings. This is perhaps exemplified by the smallest works in the show. In a stone basin in one of the corridors of the Palace is a pile of plastic coins. On one side of each coin is written Dry Earth & Scattered Ashes, on the other Dry Earth & Buried Gold. These small handheld works, which visitors are allowed to pocket, indicate a relation between ashes and gold, plunder and destruction. Yet it is not only the history of the Palace that is called into question, but also the status of art. Is art a form of debased coinage, a kind of currency that is fully implicated in the system it calls into question? Or is there still room for manoeuvre? Does art carry a degree of critical purchase? That Weiner’s show poses these questions is testament to its integrity. Their answers, however, are far from clear. 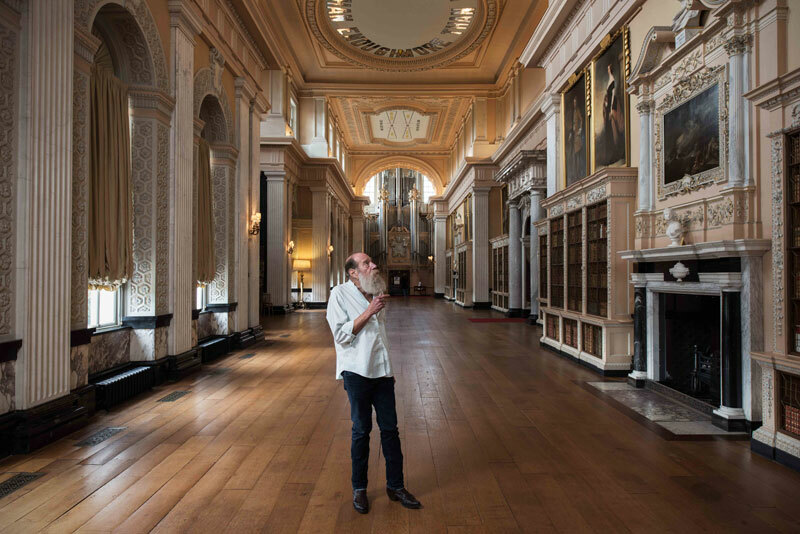 ‘Lawrence Weiner: Within a Realm of Distance’ is at Blenheim Palace, Oxfordshire, until 20 December.